My mother has been here for over a year. At first it was a wonderful place until a new director came. She hired all the wrong people and there was a lot of disharmony. She finally left and we now have a wonderful director who has turned everything around. The new head a nursing is a gem and keeps up on everyone. Her staff is amazing. The new director has also hired more staff and brought on additional nurses. She has also arranged for a doctor to come to the patients on a regular bases. All nursing homes could use more staff, but I think they are doing a great job with what is out there. The rooms are spacious and bright and I have seen more loving care. I do wish some of the meals could be better. Generally the food is fine, but they stick to the same recipes. I would like to see a little more diversity in the menu. The facility is very safe for Alzheimer's patients that tend to wander. I like the personal touches, stuffed chairs and benches, curio cabinets with period items within, pictures on the walls, two tv rooms, activity room, two dining rooms, music playing by a window. They rotate visual and tactile items on various tables for the residents to use. There are always snacks available. I really feel mom is in the best place she can be. Autumn Hills is one big family. Would never recommend for anyone with dementia. This was a poor, unsafe choice we made for our mother. The best way to get to know a community is by scheduling a tour. See the facilities, meet the staff and residents, and get a feel first hand what it's like to live at Autumn Hills Alzheimer's Special Care Center Memory Care. 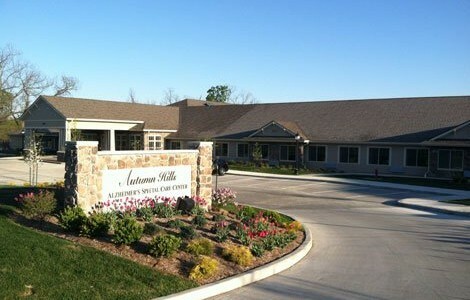 You will find Autumn Hills Alzheimer's Special Care Center located in Bloomington, Indiana. Our new community offers comprehensive care and upscale assisted living facilities, staffed by highly trained caregivers who are dedicated to ensuring you or your loved one receives the care they deserve. Autumn Hills Alzheimer's Special Care Center is part of JEA Senior Living which operates communities from the Great Lakes region to the West Coast. Founded by Jerry Erwin, JEA Senior Living is focused on providing retirement living and assisted living to seniors. Having seen a need for quality memory care following his own mother's struggle with Alzheimer's disease, he and his extended family opened their first Alzheimer's Special Care Center and have opened over 50 highly specialized centers since. From the time you step into Autumn Hills Alzheimer's Special Care Center, you will notice that no detail is left to chance. From our beautiful and secure landscaped courtyard to our activities and supervised outings or the three delicious meals lovingly-prepared by our chefs, we see to it that each day is bright and meaningful. There is an assortment of private and semi-private units to choose from, allowing personal space where residents can live their lives just as they always had, but with the services and support when needed. Independent living and assisted living communities offer a wider option of floor plans including studios, one- and two-bedroom apartment homes, complete with kitchenettes and activities tailored toward a more independent lifestyle. Our memory care facilities are centered on our Meaningful Moments program, which is designed to serve the needs of those afflicted with memory loss conditions such as Alzheimer's or other dementias. We start by getting to know the resident, understanding their preferences and favorite memories and from there we build a program for them incorporating the familiar ensuring a comfortable environment. Our electronically monitored security system is there to ensure safety. Specially trained caregivers are available 24 hours a day and seven days a week to provide guidance, support and assistance with activities of daily living. We welcome you to visit Autumn Hills Alzheimer's Special Care Center, where you will find quality personal services for you or your loved one.